Let’s see if we can get some higher pre-Final totals than last night. Indeed we do – and Catherine would have the game put away had she put down the buzzer a few clues prior. Catherine should wager 2,000 to cover Irv. Irv and Laura are both alive, but need to get it right. Wager everything. Worst. Final Jeopardy! clue. Ever. In wagering news, Irv needed to do a better job covering Laura – she could have overtaken him with a proper all-in wager. No need to let your guard down like that. Just a thought or two: does Laura want to cap her wager at 9,199 so that if Irv goes with a logical 9,400 (or 9401) to lock her out and they both get it wrong, she will take home the extra thousand? 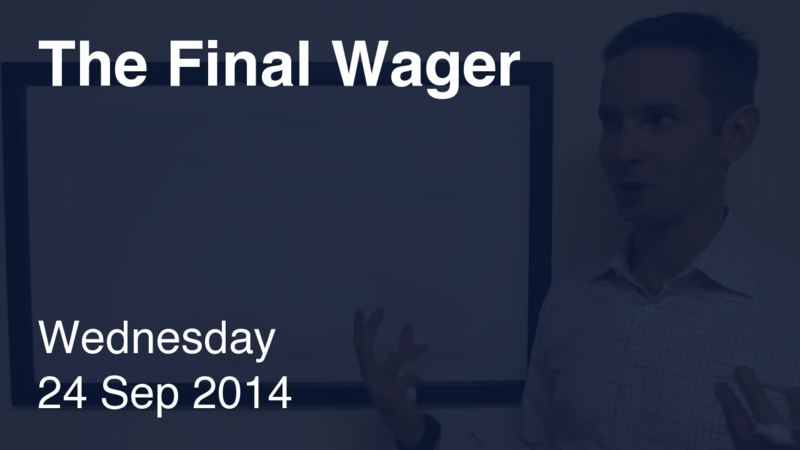 Or does she prefer to wager it all in the hopes that Catherine guesses wrong with a proper wager and Irv wagers to tie? 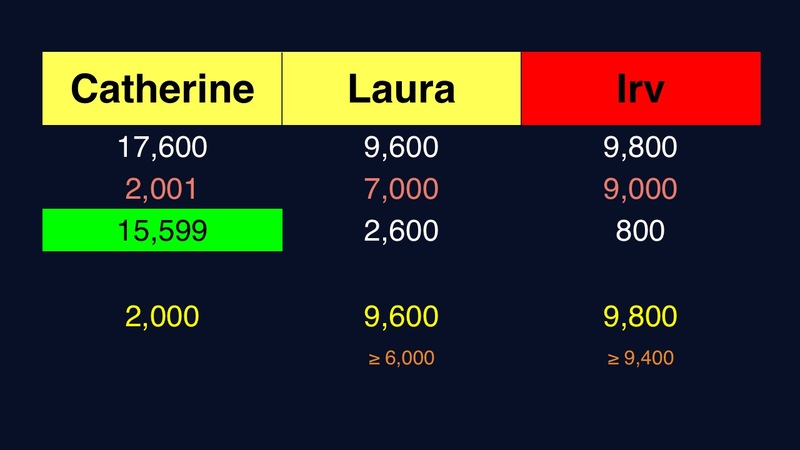 (If Catherine gets it right with a proper wager of course this wouldn’t matter as Laura would end up taking home the third place prize) Also, maybe Laura’s more effective minimum increases to 8,000 to account for a (very irresponsible and) unsafe 0 wager by Catherine? We’ve seen her tendency to lockout + a dollar on Final Jeopardy so that would really surprise me, but I see no reason for Laura to prefer a 6,000 wager instead. Ultimately, none of these minutiae would matter because it was a triple stumper on a clue that I personally had no chance on. I didn’t even really understand what they were asking for. Hey Joe – take a look at Irv’s actual wager and you’ll have my response. Only when there’s no way to win the game do I take second prize into consideration.